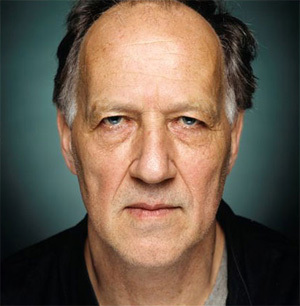 Few film directors seem as directly present in their work as Werner Herzog. Not only does he have an instantly recognisable aesthetic, but unlike most European auteurs of his generation, he has become a familiar face in front of the camera. We are so accustomed to seeing him – playing football with Peruvian indians, arguing with Klaus Kinski, eating his own shoe at Chez Panisse – that we might mistake him for just another “personality”, one of the celebrities who parade past at various scales, from cellphone to Times Square, on our screens. Directors are required to be showmen, particularly directors of documentaries, who always have to hustle to finance and screen their work. But Herzog’s presence, his insistence on being in the middle of things, is something more like an artistic strategy – which is to say it’s the very opposite of a strategy, unless it’s possible to be both strategic and uncalculated, canny and impulsive at the same time. Werner Herzog is not a great director. He doesn’t care about making things look the way he wants them to look. He wants the world to look the way it is, even if it looks cheap, or as though no-one prepared it for the camera. He’s drawn to purity. He was raised in the hills. For Herzog, people are fascinating when they behave like animals, when the natural environment ravishes niceties. He wants to film people when their survival is in question. Anything that’s not human knows only life and death. Pure existence – that’s what Herzog is after. His re-imagining of Bad Lieutenant is, he says, about “the bliss of evil”. Animal-like, the lead cop preys on crime. Shortly after Werner Herzog finished his first movie, a friend called him to let him know that his mentor (the great German film critic Lotte Eisner) was dying. Lotte Eisner was in Paris; Herzog was in Germany. His friend told him to catch a plane. But Herzog refused. Instead, he decided to walk to Paris, in the middle of winter, through clawing blizzards and morgue-like cold. Because he knew that Lotte wouldn’t die as long as he was walking. After days on the road, he arrived in Paris. Racked by illness, Lotte said to him, “I’m tired of life, but there’s a spell on me, that I must not die.” And Herzog said, “The spell is lifted.” Two weeks later, Lotte died.